May 25, 2015Comments Off on Our Studio has a New Home! I am happy to announce is that we have a new home for our studio. Not just an ordinary studio, a studio we think that could be a model for a Design Agency of the future. I’m currently 5 weeks into my Design Entrepreneurship program at the Nanyang Academy of Fine Arts (NAFA), and despite my misgivings about being the right person to teach this subject, it has been an enjoyable experience. Not to mention my surprise that I have a hand-full of students “sitting-in” the course just because they are interested in it. As they say, if you every wanted to solidify your learnings about a subject, go ahead and teach it. That being said, I notice something interesting about this whole entrepreneurship thing. 80% of being an entrepreneur is all about the process and understanding of running a business. The other 20% is having the right mindset. What is interesting is that despite being the smaller part of this Pareto equation, the 20% mindset drives the success of the other 80%. Food for thought. May 7, 2014Comments Off on Next to the Skin : 8 Weeks, 10 Wearable Concept Designs and Everything Else in Between! I’m super excited to share that today marks the launch of one of the biggest projects we have led and worked on to date. In partnership with ETPL, we brought to life The Next to the Skin Technology Showcase where in 8 weeks, we worked with multidisciplinary teams of scientists, engineers, and members from ETPL (the technology transfer arm of the Agency for Science, Technology and Research (A*STAR) in Singapore) to visualize the future of wearable solutions from the eyes of the consumer. Check out the full write up at Design Sojourn. 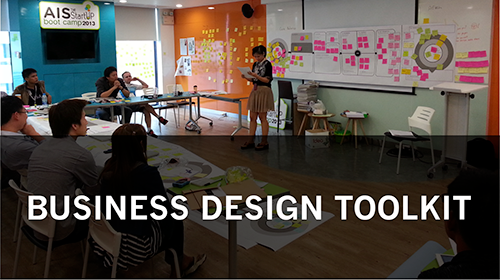 I thought you might like to know that I’ve been invited by my friends at the Shih Chien University Industrial Design Department to conduct a workshop to explore the future of the Design Practice and the Practice of Design. Check out the full activity here. Our Design Led Innovation client consulting or facilitation sessions often involves a business diagnostic activity, that is split into something I fondly call: hard and soft diagnostics. A hard diagnostic, aptly called as it covers hard financial numbers, covers things like market share, revenue, profit, margins etc. This is a pretty meaty and tangible discussion, with a lot of great tools such as the Business Model Canvas by Alex Osterwalder or the Lean Canvas by Ash Maurya to support the discussion. On the other hand, our soft diagnostic activity tends to cover the softer more human elements of a business. This includes things such as values, culture, meaning, customer needs and motivation. Much of this actually falls within the realm of Design Thinking, and as far as I know, there is no tool for this.